AlyssiaRose: Pretty Little Liars Tag! Anyway, if you don't know, Pretty Little Liars is an awesome American TV show, and I am totally hooked on it. It's full of awesome fashion, and mysteries and plot twists, along with the occasional heart wrenching storyline! Seriously I recommend that every single one of you checks it out, you will not regret it I promise. However let's get this TAG started! 1. Alison made her return to Rosewood in her statement red coat. What is your wardrobe statement piece? My wardrobe statement piece has to be a good LBD. Where would a girl be without her little black dress? I'm actually on the hunt for a new one currently, and I cannot wait to find it! 2. If you could raid anyone's wardrobe, whose would it be? Definitely Aria's. I love her unique sense of style, she's the perfect blend of feminine and rock, both styles that I admire greatly. However if I had to pick a second in line, I'd definitely go for Hannah's wardrobe.. she is equally as stylish! 3. Which cast member would you go to if you had a problem? Definitely Hannah, I think that although she can be absent minded, that she cares deeply about others, and I think she's the person who'd most likely help me sort out my problems. 4. Which character.s personality do you think you most relate to? 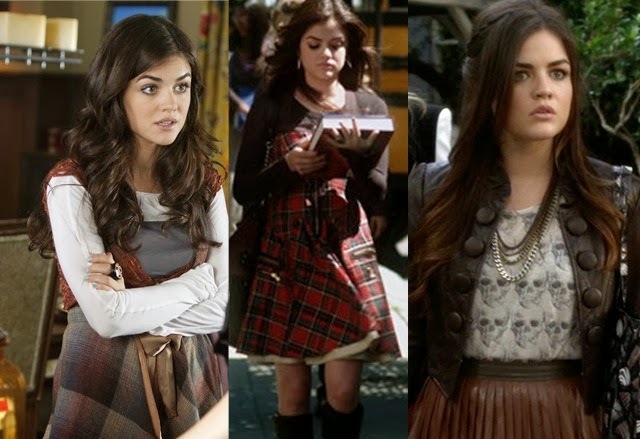 I would like to think that I am the most like Aria, but I definitely think I'm a mixture of Hannah and Aria together, which of course I don't see as a bad thing! 5. Which character's makeup would you most like to wear? 6. Which of the cast would you feel safest with when stuck in an 'A' situation? I think I would have to pick Spencer. I feel like she handles the situations better than the other girls. I think she'd fight her way out of there, whereas I think the other girls would panic... Saying that though, Aria has had kick boxing lessons now, so maybe she wouldn't go down without a fight either! So there you have it, a little insight into my Pretty Little Liars life. I hope you've enjoyed, and please leave a comment if you already watch the show! I need people to talk about it with!